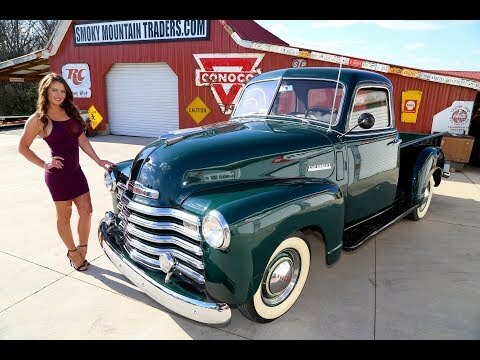 Here we have a 1948 Chevrolet 3100 for sale. This Five Window Chevy Pick Up has been an east TN truck it's entire life and has only had some minor things changed on it. It had 1 repaint in the 70's and the wood bed was replaced at some point. It was bought new from Charles West Chevrolet and stayed in the same family here in East TN until purchased back showing less than 68K miles by Charles grandson, Steve, after the previous owner and Steve had a chance meeting at a Luncheon for Local Veterans that West Chevrolet was apart of. When you walk around it you are sure to be amazed at how solid all the panels are on it. For it to be a 40+ year old paint it all still has a beautiful shine. All the gaps are even on it with an exceptional fit of the bed, doors, fenders, and hood. The tail gate was replaced, but outside of that it appears to have all the original metal. Looking inside the bed you can see the wood is in exceptional condition and I believe was replaced around the same time as the repaint was done. All the glass in this truck is beautiful and all the seals are in great condition as well. One of the remarkable things you'll notice is the steel wheels still have the Pin Stripe on them and sport a set of White Wall Tires. Next, we will look at the interior of this Pick Up. On the inside it truly is impressive. To have a truck of this age be this well taken care of is a rare find any more. The moment you open the door you can see that it has been impeccably cared for. All the door panels are in excellent condition along with floor mat, headliner, and visors. The seat cover shows some age, but when you sit down you'll be amazed at how comfortable the seat still is. Looking at the dash you'll see the original push button radio along with original steering wheel and the 3 Speed on the Column Shifter. The gauges are stunning along with all the dash metal and trim. You can see it still has the GM Tissue holder as well. This truck truly is a time capsule on the inside. Finally, we will look at the heartbeat of this Chevrolet. Under the hood it features the correct 216 inline 6 engine (casting number 3835253) that's mated to the correct Three Speed Manual Trans (casting 591615). The 216 is set up by the correct intake and the Carter W-1 Carb. This trunk is all solid under the hood, and even more impressive underneath it. All the floors and frame look to be original and in excellent condition. It has the straight axle front, the lever action shocks, and even the correct spare. This 3100 is running on the 6 Volt system and on the highway, it runs and drives excellent.